A project aims to bring an inexpensive 9-inch portable monitor to the popular $25 Raspberry Pi PC, which comes without a keyboard, mouse or monitor. The HDMIPi will include an LCD panel that will show images at a resolution of 1280 by 800 pixels. Computers can be hooked up to the monitor via an HDMI controller board that can be wired to the LCD. The display is being made by Raspi.TV and Cyntech, which are trying to get the project funded through Kickstarter. The companies put up the project on Thursday, seeking $64,500 to get it going. By late afternoon Friday Eastern Time in the U.S., more than around $58,000 had already been committed. 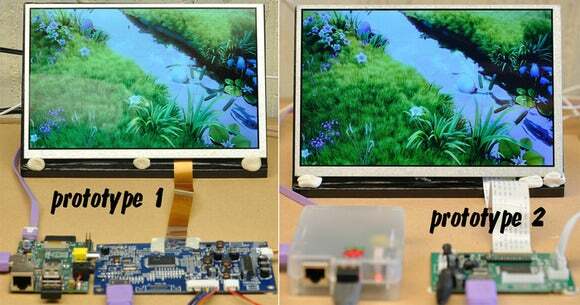 Prototypes of HDMiPi LCD monitor kits are shown above. While the monitor’s primary target is Raspberry Pi users, it can also be used with devices that have an HDMI output port, such as laptops, phones, tablets, video cameras, and gaming consoles. Raspberry Pi is a popular uncased computer that is being widely used as a media server and in some cases as a PC replacement. “We think there’s a big gap in the market for a portable, 9-inch, high-definition HDMI monitor for the Raspberry Pi. There currently isn’t an affordable one out there,” said Alex Eames, founder of Raspi.TV, in a video on the Kickstarter website. The final price of the monitor will depend on the country, Eames said in an email. “In the U.S., where the tax regime is favorable to imports, we think it could be around $100 give or take. In Europe it will be a bit more (20-23 percent) because of local taxes,” Eames said. But like the Raspberry Pi, the goal is to bring down the price as much as possible. “We’re hoping to bring out a product that is really good, but in the ‘spirit of Pi’ much more affordable than anything else comparable already out there,” Eames said. Here’s a comparison of the HDMIPi LCD monitor prototype (bottom) versus a Google Nexus 7 screen. Monitors with 9-inch screens could be difficult to find and small screens under 10 inches are made for portable devices like tablets, point-of-sale systems, or in-car entertainment systems. A 7-inch monitor is sold by Adafruit Industries for $159.95 and SparkFun Electronics sells a similar product for $139.95. The HDMIpi will be delivered in February next year, according to the project page. The planned version of the monitor doesn’t have a touchscreen, though its addition is being considered.